Engineering a single laptop to serve the educational needs of young students throughout the developing world is no easy feat. Designers at MIT's Media Lab needed to keep the cost of the machine well below $200, and yet it required many of the same features that owners of traditional laptops have come to expect: a wireless internet connection, USB ports, a color display, a built-in webcam, and a processor powerful enough to record and render video files. There were also special needs to take into account: a durable case that wouldn't crack when dropped, a waterproof keyboard designed for young hands, and an operating system designed from the ground up which could be easily altered and adapted to develop specific applications for use in the classroom. The XO-1 laptop. OLPC is now engineering the next version. Designing the laptop, it turned out, was probably the easiest piece of the puzzle. 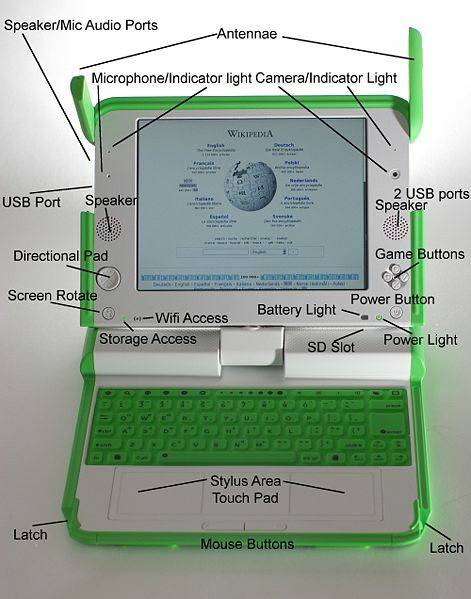 OLPC founder and chairman Nicholas Negroponte had originally touted the XO as the “$100 laptop”, but in order to produce the machine at such a low cost they would need to convince dozens of national governments to purchase tens of millions of laptops. Instead, the program was until very recently only able to convince the government of one single country, Uruguay, which ordered 100,000 machines back in October of 2007 at $188 per machine. Fast-forward 20 months – and 200,000 more laptops – and the Technological Laboratory of Uruguay (LATU) is just a couple month's away from delivering the very last green and white laptops into the hands of every single Uruguayan primary school student. Last week I visited Uruguay myself to witness how teachers and students were incorporating laptops and wi-fi connections (now in over 1,000 schools) into the classroom environment. My first gray blistery morning in Montevideo I joined a van full of professors and students from the Universidad de la República who were headed to Santa Lucía, a small town in the department of Canelones just an hour's drive from the capital. After a few accidental detours and several thermoses of mate tea, we pulled up to Santa Lucía's one and only primary school. Dozens of primary school students in white frocks were sitting on steps and tree trunks with their XO laptops, pecking away as if they were in a wi-fi café in Tokyo or New York City. I do not want to overstate the point. After all, this particular morning we were in the school's humble computer lab surrounded by eight or so teachers who all took time out of their busy schedules to learn more about the XO laptops and how they can make better use of them in the classroom. They were eager to learn and quick to make entertaining jokes about their frustrations with the new technologies. I imagined myself as a primacy school instructor – with over 20 years of teaching experience – having to learn new teaching techniques from volunteer university students who have never experienced the enormous challenge of keeping a classroom in order. Each of the teachers created her own individual blog, and they then created a group blog for the entire school titled, appropriately enough, Escuela 104 de Santa Lucía. Te cuento que soy una maestra de primer año de la escuela Nº 104 “Leticia Volpe” ubicada en la ciudad de Santa Lucía ,depto Canelones .Se encuentra ubicada en las calles R. Argentina, Tajes, Brasil y Tajes.Es una escuela de doble turno con un total de 700 niños aproximadamente. Estos son mis hijos……..
La Escuela Nº 104 se encuentra ubicada en la ciudad de Santa Lucía, a orillas del río del mismo nombre. En sus comienzos, fue escuela sólo para varones, con el correr del tiempo eso cambió y se transformó en escuela mixta como sigue siendo actualmente. Mi madre concurrió a esta escuela, que la llamaban la “escuela grande” porque ocupaba toda la manzana (actualmente compartida con el liceo Nº2). School 104 is found in the city of Santa Lucia, on the bank of the river with the same name. At its beginning it was a school only for boys, but with the passing of time that changed and it became the mixed school it currently is today. My mother once competed against this school, which she called “the big school” because it occupied a large space (which is now shared with the lyceum). To be highlighted in our city is the first hotel for tourists in this country, the Biltmore Hotel. You can use Google's machine translation to read the rest of the teachers’ entries. The morning blogging workshop was facilitated by Pablo Flores and Mariel Cisneros Lopez, both professors from the Universidad de la República. But in the afternoon session, attended by over a dozen teachers, the university students took the lead, facilitating an outstanding workshop that got the teachers enthusiastic about the possibilities of blogging in the classroom. Flor de Ceibo will continue to organize expeditions to primary schools across the country in order to show teachers and students how they can share their stories, articles, and homework assignments online by using the EduBlog platform. Later in the year, with the financial support from their Rising Voices microgrant, they will organize a competition which awards prizes to students who publish the best entries about particular topics chosen by a committee of judges. In the second part to this post, we will examine how EduBlog was created and how the CeibalJam movement is creating a local, dedicated community of open source volunteers who program for the XO laptop. I like the image of an open-aired café under the tree. Did you see any of the cool handmade carrying cases that I saw when I visited in 2007? The cases they kept the computers in were certainly diverse, but I didn’t see any which were handmade. Then again, this school only received their laptops two weeks prior to our visit so the customizations might be forthcoming. This is not correct. While Uruguay was the first country to commit to purchasing laptops. Peru and other countries followed within weeks, before the end of 2007. There are now roughly 40 countries with XO laptops, and over 15 who have thousands. “There are now roughly 40 countries with XO laptops, and over 15 who have thousands”. “First world” countries children have access to whatever they want, but their “toys” are not integrated to any educational system, it’s rather voluntarism where each individual has to choose between the good and the bad offered in the internet. Uruguay was not only the first buyer of the machines, but the first if not the only one that has the base for implementing them in an unified and coherent educational system unlike other.That’s why they are so interested in what it’s going on in Uruguay! and coherent education system. Let me know of any other country in the world where such implementation is occurring. Great blog posting David – would have loved to have been there to see all these kids using XO’s – what an amazing sight. Great article. It nicely presents the success of the XO as hardware, and quite accurately (in my opinion) indicates that this “was probably the easiest piece of the puzzle”. Uruguay appears indeed to have been quite successful in setting up connectivity and infrastructure. There is an area we hear very little of, and maybe it has not been as successful as distribution and connectivity. You mention it: “how teachers and students were incorporating … into the classroom environment”, “how to implement the laptops into their curricula and classrooms”. Please, could you tell us more? The appearance is that it is not happening across the board, beyond a few anecdotes here and there, and it might have been good you visited a school that has had the XOs beyond the honeymoon effect, and you could tell us about, hopefully, success in these machines having some results in actual learning happening in the classroom, about which there are no detailed, factual reports, from anywhere (I cannot count the “50% improvement in reading” that supposedly happened in Peru – claim that had no evidence attached). Please, this is VERY important, especially as many of us are waiting to see XOs actually are something where actual, measurable learning happens. There was one line that could have been re-written, but otherwise a great article that I appreciated reading this morning. I hope that you will continue with this project and provide updates, I know that with the small and connected (ha!) communities in Uruguay a project like this has the chances to take new meaning and grow very fast. it is great article, and I loved the picture of the kids with their laptops.